Squirrels are one kind of wild animal that is not having any trouble adapting to human civilization. Personally, I am conflicted about squirrels. On one hand they are cute. On the other hand, they are just invasive rodents with bushy tails. My Chinese tutor has been having some trouble with squirrels lately, but is it really their fault….? First thing in the morning, when I still hadn’t gotten out of bed, I heard a loud noise on the roof. I think there is a squirrel race on my roof! I don’t know why all the squirrels in my neighborhood are so fat! Usually plump people are comparatively slow. However, even though these squirrels are very fat, (but) they are still very fast. Possibly I feed them too much…. I often put some nuts and bread crumbs that I don’t want outside. So, squirrels come to my house outside of the glass door to eat them. (I) hope the squirrels who find (the food) are fairly selfish. (Then they) won’t tell their comrades! I don’t want a lot of squirrels to come to my house! ❶ When you use the sensing verbs by themselves, it indicates you have taken action to engage your senses yourself. If 到 or 見 are added, then the sensing has occurred, not because you sought out the experience, but because you were there to experience it. ❷ 可是 and 不過 are basically interchangeable, much like however and but are in English. 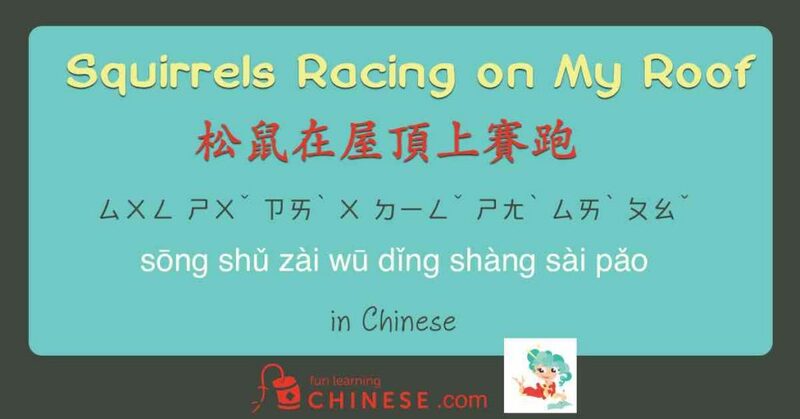 ❸ When my tutor was growing up, she constantly heard this pronounced ㄒㄩㄝˋ (xuè) but she has also always known that the dictionary uses the pronunciation given in the sentence. ❹ Notice that the they here is the one used for inanimate objects. It is the food being referred to.